This post is long overdue. Like, four months overdue! Oops. Back in June I attempted to take part in the #bookaday tag. Unfortunately I was completely useless and barely managed to keep up - fail! I thought it would be nice to bring it all together into one post, using the cues from the #bookaday tag, to share with you some of my favourite and most-loved reads. I will link to any book reviews I've done as I go through, remember there aren't any spoilers, just a brief synopsis and my thoughts. Enjoy! 1. Favourite book from childhood: I guess it depends how old we're talking, but if we do mean 'childhood' this has got to be any of the Narnia stories by C.S. Lewis. My brother used to read The Lion The Witch and The Wardrobe to me as a kid, and then I progressed to watching the BBC adaptation of it every morning before school. I knew the entire script off by heart. 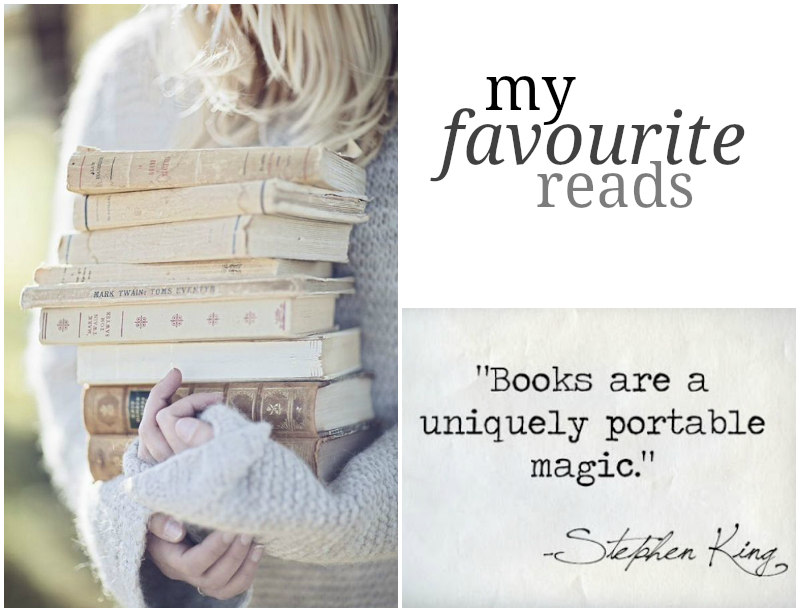 I also loved Prince Caspian and The Silver Chair - true classics and great stories to cultivate my love of reading and losing yourself in the magic of a good book. 2. Best bargain: The Sense of an Ending by Julian Barnes. I picked it up in a charity shop for under a pound, but have to admit I've still not read it! I was drawn in by the pretty cover and good reviews online. 3. One with a blue cover: Room by Emma Donoghue (read my review here) or Wonder by RJ Palacio (read my review here). Loved both, especially Wonder - don't be put off that it's meant to be for younger people, I wasn't! A really important read, especially if you work in education. 4. Least favourite book by favourite author: The Mystery of Mercy Close by Marian Keyes. I can't say I have an absolute favourite author, but I feel I can always rely on Keyes' books to make me laugh and get me stuck into a storyline. This one really didn't - I kept trying to like it but just couldn't get into it. 5. Doesn't belong to me: Chavs by Owen Jones. Borrowed from my boss, I have read most of it but I dip in and out rather than ploughing through the whole thing. I really agree with Jones' political views and he makes some really great points on social class and the demonisation of the working classes in this book, definitely worth a read. 6. The one I always give as a gift: The Help. My favourite book of all time, I just love it. I enjoy reading about the civil rights movement which this is based around. Great characters who were brought to life perfectly in the film adaptation. 7. Forgot I owned it: Sweet Tooth by Ian McEwan. Well, I forgot I had it back in June when I did the tag originally! I have now dug it out and read it - the joys of doing something like this! I was given Sweet Tooth by Amy as part of the Bloggers Book Swap organised by Rosie. Thanks girls, a great idea. 8. Have more than one copy: The Thread by Victoria Hislop. I absolutely love this book, and at one point had three copies after picking it up several times over in various charity shops. I don't know what's happened as I now have no copies! I always recommend this to friends, and have clearly forgotten who I lent them to, oops. You can read my review here. 9. Film or TV tie-in: I have to be completely honest here and admit my love for the Twilight series by Stephenie Meyer! I loved the books so much (yes, I know they're not written particularly well, but I don't care) and will happily admit I completely fell in love with Edward. Several times over. The films are what I turn to when Rich is out and I can watch guilt-free! In terms of TV tie in, I'm still to read Case Histories by Kate Atkinson after hearing great things about the TV adaptation. What do you think - any good? 10. Reminds me of someone I love: Gone With The Wind by Margaret Mitchell without a doubt. Every year me and my Mum watch the film around Christmas time (so I guess it also fits into the previous category too! ), and its only been in recent years that I've read the book. Its a pretty mammoth undertaking, but an exceptional story of love, family, suffering and perseverance. It without a doubt makes me think of my lovely Mum. And Scarlett O'Hara, who I also love! Whadda woman. 11. Second hand bookshop gem: I can't really pick a single book for this one as nearly all my books have been from the charity shop! I rarely buy books new these days, but instead write them down in my 'to read' list, and then look out for them in one of my local charity shops. Saves you money whilst doing a good deed at the same time. 12. I pretend to have read it: we all have one of these, don't we. People always go on about how amazing To Kill a Mockingbird by Harper Lee is, and I always go along with it. I'm such a liar, as I've not read it! How did that happen?! Its on my 'to read' list, don't worry. 13. Makes me laugh: this has got to be Rachel's Holiday by Marian Keyes. I absolutely adore this book! So hilariously funny, but also touching and sincere. A must read. The same can be said for This Charming Man by the same author. Check out my homage to Marian Keyes here. 14: An old favourite: Falling Leaves by Adeline Yen Mah. I found this in the bookshelf of a holiday home we were staying back in the summer of 2012, and quickly remembered why I loved this so much as a teenager. When I was even younger than that I read Chinese Cinderella, which I simply loved - this is the more adult version. Even years later I still completely loved it - a true favourite. Check out my review here. 15. Favourite fictional father: ooh, a tricky one. Not exactly a 'father' as such, but I grew up with the Harry Potter books, and totally loved Dumbledore. I definitely cried into my pillow when he, ya know... (does anyone not know what happens to Dumbledore?!). I guess also Arthur Weasley was a bit of a hero. 16. Can't believe more people haven't read: Sister by Rosamund Lupton. Such a well written, chilling tale. If you've not read it, do! I reviewed it here. Afterwards is also excellent (review here). 17. Future classic: I'm gonna go out on a limb here and say potentially The Fault in Our Stars by John Green, partly just because of the huge readership. I really enjoyed the storyline and definitely shed a tear. You can read my review here. I've not seen the film yet - is it worth watching? I'm not sure I can deal with the emotions! 18. Bought on a recommendation: most of my books are bought on some sort of recommendation, but I recently read The Book Thief by Markus Zusak after hearing great things from Kat. We have a really similar taste in books and are always swapping books and titles with each other, but this one just didn't do it for me. Find out why here. 19. Still can't stop talking about: Gone Girl by Gillian Flynn. I read this way back in February/March of last year (review here) and still find myself thinking back to the storyline and just how nuts it is! Of course, with the film coming out tomorrow in the UK it's a hot topic - we're all talking about it! I can't wait to see it next week. 20. Favourite cover: I'm really loving the new covers of Jojo Moyes's books at the moment - The Girl You Left Behind (review) and The Last Letter From Your Lover (review) have had really beautiful cover designs, and I like that they share the same theme. And of course Me Before You (review) which I absolutely loved. I am honest enough to say when I'm browsing the shelves of my local charity shop, I definitely look out for a pretty cover! 21. Summer read: without a doubt, The Island by Victoria Hislop. If you ever visit Crete, this is the book for you! Set in the island itself, it tells the story of Spinalonga - the leprosy island just off Plaka, Crete. A fictional story, but you can still visit the island (now called Kalydon) which I would love to do. As the review on the cover says, "a beach book with a heart". Perfect. See my review here. 22. Out of print: not sure I can answer this one. Sorry! 23. Made to read at school: I remember reading Of Mice and Men by John Steinbeck for GCSE English Literature, which I really enjoyed. I would like to read it again actually, so have added it to my 'to read' list! I also loved reading An Inspector Calls by JB Priestly, a play rather than a novel. Again, I'll be looking out for that as have really fond memories of it. 24. Hooked me into reading: I've always loved reading, even from a really young age I remember having my nose in a book and progressing quickly up those colour coded books in school! I guess the turning point for me was when Harry Potter and the Philosopher's Stone was released when I was ten years old. I remember it sitting on my bookshelf for about six months before actually picking it up... and in an instant I was hooked. I would read for hours at a time, completely absorbed in this other world. JK Rowling is one clever woman! 25: I never finished it: I have quite a few I could give for this, as in recent years I have adopted the mentality "if I don't get hooked by 100 pages, give up". Who has time to read bad books? I guess most recently it is How to be a Woman by Caitlin Moran. I read about half of it but was put off by graphic period talk. I know, I'm pathetic. I will finish it... someday! 26: Should have sold more copies: that's a tricky one as I don't really follow which books are the biggest and best sellers, but I really enjoyed The Other Hand by Chris Cleave early last year, which wont be on many people's radar. You can see my review here to see why I loved it so much. Saying that it might have been a huge seller... I really don't know! 27. Want to be one of the characters: without a doubt, Katniss Everdeen. She's just so cool, right? And if that meant that I looked like Jennifer Lawrence, I wouldn't complain! I really enjoyed The Hunger Games trilogy by Suzanne Collins (review here) and sped through all three reads in record time. 28. Bought at my fave independent bookshop: this is a hard one again, as I do most of my book shopping at charity shops. I do sometimes get that pang of 'I should be supporting local bookshops' and feel like a bad person, but oddly I there isn't one in my town. I guess my recent favourite charity shop buy was Norwegian Wood by Murakami, which I'd been trying to find for a long time. I've not read it yet, but have heard great things. It's next on my list. 29. The one I've re-read most often: I rarely re-read books as always have so many queued up to read, but if any it would (once again) go to the Harry Potter collection. Before each film came out I would re-read the book to remind me of the story. I have so much love for these books, they really shaped my childhood and teen years! 30. Would save if my house burned down: blimey! Not sure I'd go back for any of my books to be honest - I mean, I love them, but they're replaceable. I do have a Good Housekeeping Cookery Book however that my Mum and my Nan both owned, so it would probably be that, for sentimental reasons. It's huge, like a cooking bible! Right, so that's me done! Blimey. 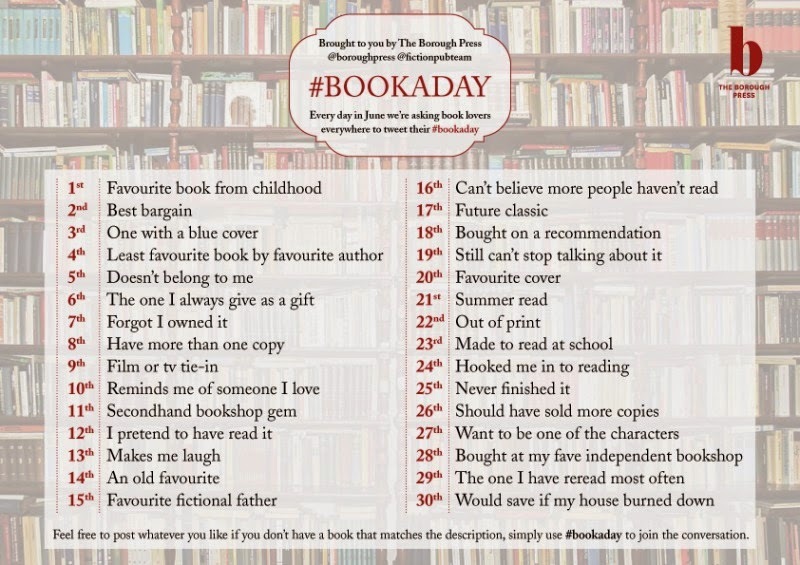 Please let me know if you do the #bookaday tag too, I'd love to see your favourites! I started this and never finished it too. I feel like we have a very similar reading taste, have you read Afterwards by Rosamund Lupton, I really enjoyed that one. Also have to agree with you about The Mystery of Mercy Close, which is a shame as I loved helen as a character in all the other books.